Give a meaningful sentiment that puts into words the lasting friendships you share. A beautifully painted art glass suncatcher that catches the light for a stunning window display. 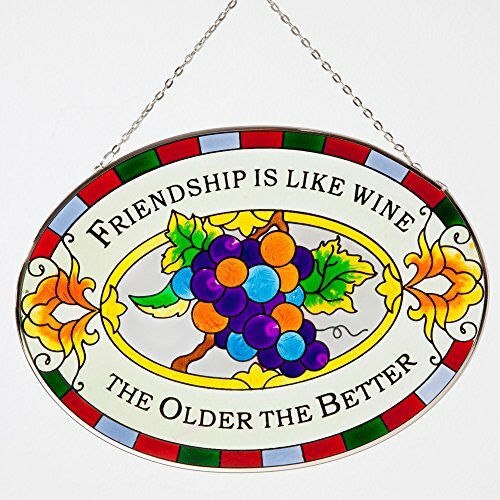 A thoughtful gift for friends and wine lovers measuring 8 ¾ "x 6 ½" complete with metal chain for hanging. Give a meaningful sentiment that puts into words the lasting friendships you share. A beautifully painted art glass suncatcher that catches the light for a stunning window display. A thoughtful gift for friends and wine lovers. Comes with metal chain for hanging. Measures 8 ¾ "x 6 ½".